Summary - While watching over the dying Faramir,Ioreth is shocked when Gandalf brings a stranger to tend him. It had been a long day already, and no end in sight. Ioreth sighed as she bustled hither and thither. No sooner had one wounded man been tended than another took his place. In all her long years serving in the Houses of Healing, she could not remember a day like this before. More than once the old woman had felt afraid and wished that she had accepted her cousin Tasariel's offer to stay in Lossarnach to escape the fighting. Ioreth sighed; if the murdering devils overthrew Minas Tirith there would be so safety anywhere. It was no use dwelling on what might happen, though, better to get on with the job. Ioreth bandaged a gaping wound in a man's leg after carefully cleaning and stitching it. At least he would live, unlike her neighbour's boy, Fingon. There had been nothing she could do for him save hold his hand while he coughed up his lifeblood after taking an arrow in the lung. They seemed to be bringing in fewer casualties now, but she had no idea what was happening outside. She straightened up after securing the bandage, rubbing her aching back as she did so. "You should get some rest, Dame Ioreth, you are not as young as you used to be." The Warden startled her. "I will still be standing when the younger ones fall down with weariness!" Ioreth replied tartly, glaring at her superior. "There is still much to be done here." "Go and sit with Lord Faramir then," the Warden replied. "There is little hope that he might awaken, but I would not have our new Steward left alone. He is in the honoured guest's chamber." "Have you not heard the tidings? Lord Denethor decided to burn himself alive and take his son with him." The Warden shook his head sadly. "Mithrandir snatched Lord Faramir to safety, but I fear all we can do is grant him a more comfortable death. He is suffering from the Black Shadow and is beyond our aid." For once Ioreth was rendered speechless. The Warden hurried off as a young healer called for his assistance. Still feeling stunned at the grim tidings, she hastened to Lord Faramir's room. A young woman rose from a chair by the bed when she entered. "I have tried my utmost, but I cannot bring the fever down," said the girl. "Fever rarely accompanies the Black Shadow," said Ioreth taking her place at Faramir's bedside. "Most of the victims lie cold and still." "What else could it be?" said the young woman. "His wound is not infected, but we cannot rouse him, and he grows weaker by the hour. I doubt he will last until the morrow. I leave him in your capable hands, Dame Ioreth." With those gloomy words, she turned and left the chamber. Ioreth sank down on the chair the girl had vacated. Never would she admit it, but it was a blessed relief to rest her aching back and feet. She turned and studied Faramir who tossed uneasily upon the bed. A wave of sadness washed over her. She remembered the lad being born, having been a very junior assistant to the midwife who delivered him. He had been a beautiful babe who had grown into a fine young man. Personally she thought him by far the best of his family. She had never much liked Lord Denethor whom she considered cold and hard. A lore master he might well have been, yet he lacked the wisdom not to even try to conceal his lack of affection for his youngest son. He had pushed Faramir far too hard. As for Lord Boromir, Ioreth had thought him a brave warrior with a good deal of charm, but much too full of himself. Faramir had been different, a brave soldier, so she'd heard, but also a man of wisdom and learning gifted with his mother's gentle heart and gracious air. Now the Lady Finduilas had been the most noble, gentle, and gracious of ladies. Ioreth had grieved to see her wither and fade. She still considered it a scandal that Lord Denethor had not sent her back to Dol Amroth to regain her health and spirits, or at the very least to the good country air of Lossarnach, but no, he must keep her ever at his side like a bird in a cage! Now Finduilas' last remaining child was dying. It hardly bore thinking about, such a lovely young man, who would have made a wonderful Steward. 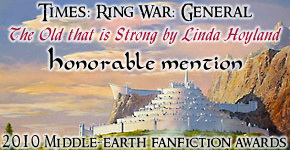 Groaning slightly as she rose to her feet, Ioreth felt Faramir's burning forehead. She dipped a cloth in the bowl of water left at Faramir's bedside and bathed his face and neck. She shuddered when she noticed his hair was covered in oil, no doubt from his narrow escape from being burned alive. She would have liked to wash it, but feared worsening his fever. "Come on, lad, wake up and talk to old Ioreth!" she called. "You never failed to greet me before. You badly need a drink and some willow bark tea with a fever like that, but I cannot give it you unless you wake up for me, or it would choke you! Wake up! Gondor has need of you and you'll break this old woman's heart along with many others, if you leave us now!" Faramir made no answer and gave no sign of having heard her at all. Gently, Ioreth stroked back the oil and sweat soaked hair from around Faramir's handsome features. His high lineage, powers of the mind, and true nobility had set him apart from all others. And there was nothing she could do to help this beloved son of the City, who was now her lord, to prevent him from dying! The Black Shadow was beyond all aid: unless of course the old tales were true. What if they were? There was still no one who could save Faramir. Ioreth found herself weeping, something she had not done over a patient for many a year. Just then Mithrandir entered with the Warden. After barely acknowledging Ioreth's presence they briefly examined Faramir, talking in low voices all the while. Ioreth was unimpressed by the Wizard; that was if he were any such thing! Surely if he did possess magical powers, he could cure poor Lord Faramir? "Alas, if he should die! Would that there were kings in Gondor, as there were once upon a time, they say! For it is said in old lore: The hands of the king are the hands of a healer. And so the rightful king could ever be known." Ioreth cried bitterly. This is what it's come to, then, in our once great City, she thought; hoping for things, and kings, that have long since passed away. Gandalf's eyes lit up as he replied, "Men may long remember your words, Ioreth! For there is hope in them. Maybe a king has indeed returned to Gondor; or have you not heard the strange tidings that have come to the City?" "I have been too busy with this and that to heed all the crying and shouting,' she answered. 'All I hope is that those murdering devils do not come to this House and trouble the sick." Ioreth wondered crossly if the interfering old stormcrow thought she had the time to watch the battle as well as tend those wounded in it! Followed by the Warden, Mithrandir hastened away leaving Ioreth alone again with Faramir. She pondered his strange words. The Steward of Gondor held rod and rule until the king returned, but since there had been no sign of any king for well nigh a thousand years. Everyone had long ceased to hope that any descendant of the old kings would come forward to claim his inheritance. Maybe the Wizard meant the King of Rohan? But what did the Lords of the Mark know of healing arts? If Lord Faramir's horse were ailing, maybe they might be of some use, but otherwise the idea seemed ludicrous. She could only think that all the fighting had scrambled the old Wizard's brain!" Just then, another woman came to sit with Lord Faramir, and Ioreth resumed tending for those wounded that she was able to aid. Less than an hour elapsed when the boy Bergil, who was running errands, brought a message that she was needed in Lord Faramir's room again. With a heavy heart, Ioreth obeyed, fearing that the young Steward was about to breathe his last. To her dismay, the room was now full of people. Mithrandir, the Warden, Prince Imrahil, and the Halfling, Pippin, she recognised, together with several of the women she worked alongside, who should have known better than to leave their duties, as well as some of the less seriously wounded, who should not have left their beds, who were hovering in the doorway. Two strangers caught her attention; a tall fair haired young fellow; maybe this was the King of Rohan, though she had heard he was an old man, and an even taller dark haired man, whose carven features and great height reminded her vaguely of Lord Denethor and his youngest son. This was a scruffy, ill kept fellow, though, clad in a dirty grey cloak secured by a brooch set with a green jewel, over a coat of mail. His face was drawn with exhaustion and streaked with sweat, and blood, and grime. To her horror he was examining Lord Faramir! At least his hands appeared clean, but whatever was the Warden thinking of, letting a bloodstained soldier put his presumptuous hands on their young Steward? "Whoever is that ragamuffin?" Ioreth asked one of the women who had crowded into the room. "I've no idea," the younger woman replied. "I think he's a Captain on the Northern Rangers," said one of the walking wounded. "I saw him on the battlefield earlier." The supposed captain looked up and addressed her, "You have store in this House of the herbs of healing?" he enquired. Normally Ioreth would have retorted angrily. How dare this ruffian trouble her at so dire a time? Yet, there was something in his tone of voice, and a light of nobility in his eyes that made her answer respectfully. "Yes, lord," she answered; "but not enough, I reckon, for all that will need them. Why, it is days out of count since ever a carrier came in from Lossarnach to the market. But we do our best in this House with what we have, as I am sure your lordship will know." "I will judge that when I see," said the man. "One thing also is short time for speech. Have you athelas?" "I do not know, I am sure, lord,' she answered, "at least not by that name. I will go and ask of the herb-master; he knows all the old names." "It is also called kingsfoil," said the stranger; "and maybe you know it by that name, for so the country-folk call it in these latter days." "Oh that!' said Ioreth. 'Well, if your lordship had named it at first I could have told you. No, we have none of it, I am sure. Why, I have never heard that it had any great virtue; and indeed I have often said to my sisters when we came upon it growing in the woods: "kingsfoil" I said, " 'tis a strange name, and I wonder why 'tis called so; for if I were a king, I would have plants more bright in my garden". Still it smells sweet when bruised, does it not? If sweet is the right word: wholesome, maybe, is nearer." "Wholesome verily" said the man. 'And now, dame, if you love the Lord Faramir, run as quick as your tongue and get me kingsfoil, if there is a leaf in the City." Ioreth turned and scuttled from the room as if pursued by a troop of Orcs. She had no idea that she could still run so swiftly. She hastened to where she knew the herb-master would be found in his room by the herb garden. He was occupied in crushing comfrey leaves to prepare salves for the wounded. He barely looked up when she entered. "There are fresh salves on the shelf there," he said without looking at her. "I have come to ask if you have any kingsfoil here?" said Ioreth as soon as she could get her breath back. "Kingsfoil? Whatever do you want that for, woman? We have far worse matters than headaches to deal with here!" "A stranger says he needs it to help Lord Faramir." "Well, tell this stranger we don't keep such useless old wives remedies here," the herb master said impatiently. "You had better come with me then. The Warden demands your presence. "It seemed better to say the Warden, than that a stranger seemed to have taken charge of Lord Faramir. Grumbling, the herb master accompanied Ioreth back to Faramir's room where he explained to the stranger and Mithrandir in great detail that he did not keep such a humble herb as kingsfoil in the Houses. Mithrandir impatiently sent him to find some. Ioreth could only hope that some of the old folk who had not left for safety might have a few leaves stored to freshen the air. Ioreth watched fascinated as the stranger, who by now had shed his armour and was clad simply in a worn shirt and breeches much in need of a wash, knelt beside Faramir and laid a hand on his brow and called his name. She bit back a sharp comment. A fine lot of good that would do the poor young man! She could have cured him swiftly herself if all it took were words. The stranger's face became even more haggard, and his skin turned grey with fatigue. He looked as if he were about to collapse. He repeatedly called Faramir's name. It seemed as if some great struggle were taking place. "Sir," Ioreth said anxiously. "Should you not take rest?" The stranger gave no answer. He seemed as removed from them as poor Faramir, and walked afar in some dark and dreadful place calling for one that was lost. Ioreth recalled a time when she was a girl and her father had sent her to search for a lamb that had strayed. She had found the beast, but could not find her way home in the dark and had stumbled amongst the brambles until she saw a lantern in the distance, and heard her father's voice calling her home. Time passed and still the struggle continued. Ioreth was surprised that Faramir still breathed. She wondered if it were somehow the power of the stranger's will keeping him within the circles of the world. She doubted this could go on for much longer as the stranger now looked in a worst condition than the man he was trying to save! Just then Bergil came running in, and he bore six leaves in a cloth. "It is kingsfoil, Sir," he said; "but not fresh, I fear. It must have been culled two weeks ago at the least. I hope it will serve, Sir?" Then looking at Faramir he burst into tears. The stranger turned to face him, suddenly roused from his trance. "It will serve," he said, smiling at Bergil. 'The worst is now over. Stay and be comforted! I need hot water brought quickly." Two of the younger women hurried to do his bidding. The stranger crumbled two leaves in his hands and suddenly the stale air in the room became as fresh as if a living breeze blew through it. Ioreth felt a sudden surge of sheer joy that she could not explain. One of the young women brought in a bowl of steaming water and placed it on the table beside Faramir's bed. The stranger cast the leaves into the bowl and he stood up. Ioreth realised he was easily the tallest man in the room. There was an air of something about him that she could not quite define. 'Kingly' seemed the only word to describe him. He smiled and held the steaming bowl in front of Faramir's face. "Well now! Who would have believed it?" said Ioreth to a woman that stood beside her. "The weed is better than I thought. It reminds me of the roses of Imloth Melui when I was a lass, and no king could ask for better." To her amazement Faramir stirred and opened his eyes to gaze at the stranger. She had never seen such a look in his eyes before. It was as if he recognised the man, and loved him with the strength of love that a son might have for a father. A similar look was in the stranger's eyes, as if he recognised a long lost beloved kinsman or friend. "My lord, you called me. I come. What does the king command?" Faramir said softly. "Walk no more in the shadows, but awake!' said the stranger. "You are weary. Rest a while, and take food, and be ready when I return." "I will, lord,' said Faramir. 'For who would lie idle when the king has returned?" "Farewell then for a while!' said the man hailed as king. "I must go to others who need me." He lightly kissed Faramir on the brow and turned and left the chamber together with Mithrandir and Prince Imrahil, which surprised Ioreth. She thought the Prince would surely wish to stay with his nephew. She went over to Faramir and felt his brow. There was no trace of fever. There could be no doubt who the stranger was. "King! Did you hear that? What did I say? The hands of a healer, I said!" Ioreth exclaimed to anyone who would listen. Why, the old lore was right and Gondor had a new king! A/n. Some lines are taken directly from Tolkien's "The Return of the King."